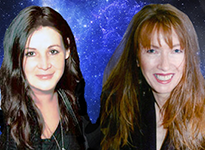 While Mercury moves back into Gemini today — the sign it rules — it’s also still retrograde. This can be a bit of a double edge-sword (or three of them in the case of this card) as it can increase the disagreements and miscommunications that are associated with Mercury retrograde. The Three of Swords is often associated with emotional disharmony, heartache and separation. And you could be dealing with the fallout from this very thing today. But keep in mind that disharmony is usually rooted in misunderstanding, or at the very least a misassumption about your role in someone else’s life. Mercury at 29° Gemini is conjunct the fixed star Betelgeuse, which is favorable in general but can also be quite volatile. Betelgeuse is said to have Mercury and Mars undertones, which can contribute to the harsh words and snap decisions that lead to the heartache associated with this card. 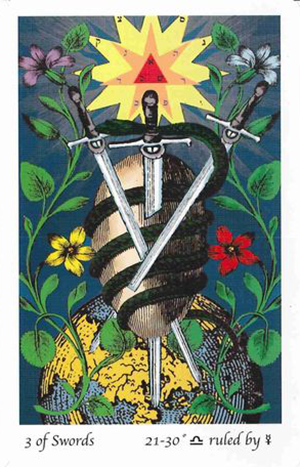 In this version of the card there are three Swords lancing a serpent-entwined egg — known as the Orphic or Cosmological Egg. This represents the seed of life — that from which all else springs — as well its infinite potential. In this respect it can be said that the swords lancing it represent a necessary separation. A need to “cut through” that which is no longer serving you, in the spirit of making room for what does. If you’re nursing your wounds from a recent falling out — or deciding whether to end a relationship yourself right now — think first about all of the repercussions. While it may not be easy to unwind all of the interconnections that have bound you to another, it may be necessary. The Three of Swords doesn’t have to mean an ending. But it does refer to a lancing and releasing of whatever needs to released. If there is something (or someone) you’ve been struggling to let go of, now is the time to make the effort to do so. It’s the severing of all that’s been holding you back that will permit you to finally start movinging forward again. The card used for today’s tarotscope — Three of Swords — is part of the Tarot of the Holy Light series, designed by Christine Payne-Towler and Michael Dowers. Used by generous permission. This entire deck is so rich with esoteric symbolism that a single “daily draw” doesn’t even scratch the surface. It is also not a Rider-Waite or Golden Dawn based tarot: it’s what Christine refers to as “Continental Tarot” which she is very well versed in. Although this is not a beginner deck it’s so worth having for the serious student or collector. This deck is also now available for iPhone/iPad and Android devices through the Fool’s Dog website. Be sure to visit and “like” their Facebook Fan Page.